The Redblock Niche Prevents Water Damage with its Unique Mounting Flange. Easy Waterproof Installation with the M-Block™ waterproofing flange. 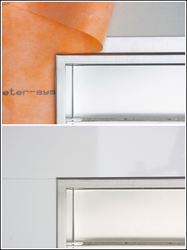 Our objective with the M-Block™ flange was to have the finished shower niche become part of the shower membrane system. Redblock Industries today announces an innovation in shower waterproofing, the M-Block™ mounting flange. It is a mounting system that is incorporated into its shower niche products to help installers create a leak proof shower. With the M-Block™ flange, Redblock has created a shower storage fixture designed to solve a growing problem of leaking tiled shower niches. The Redblock M-Block™ flange will work with the shower waterproofing membrane to create an uninterrupted barrier against water infiltration, preventing mold growth and other leak issues. The M-Block™ flange is used for mounting on all Redblock niche products but also integrates with its tile border flange; an attractive stainless steel edge for tile work. This saves the time and labor required to install tile edge trim around the shower niche; a notoriously meticulous task. And since the entire Redblock niche is finished with brushed stainless steel, it saves tiling inside the niche and provides a finish that is complimentary to existing fixtures. The M-Block™ flange and the entire niche are constructed as a welded uni-body unit; using the same techniques and materials as are used to produce a stainless steel sink, so they are incredibly sturdy and immune to water infiltration. "Our objective with the M-Block™ flange was to have the finished shower niche become part of the shower membrane system." "We felt that this was a missing piece of the puzzle in creating a fully waterproof shower." In his experience with SKG Renovations, Steve noticed an increasing number of tiled shower niches that are incorrectly waterproofed. This was the basis for the development of a shower niche fixture with waterproofing built in; the Redblock shower niche with the M-Block™ flange. A fixture that can be easily installed to be watertight, with less chance for error by the installer. How Important is Shower Membrane Waterproofing? Or go to the Redblock Industries website for more helpful articles about shower niche installation; from Shower Niche Planning to articles that help installers avoid common shower niche install mistakes. Redblock Industries manufactures and sells a stainless steel finished shower niche. They will be developing more products like their finished shower niche, designed to replace some of the custom-built structures common in a bathroom remodel.